Sacramento Faces Race (SFR) is a grassroots, unfunded, all volunteer, project run by college students, academics, faith leaders, and professional social justice workers. The goal of the Sacramento Faces Race weekend is to recognize and understand systemic racism from a Black-American experience and perspective– to learn how it operates; to see how it affects individuals and our communities, and to provide a springboard for positive and equitable change. Participants are invited to (or may host} professionally facilitated panel discussions, creative programming opportunities, or simply download a self-directed discussion. It was conceived and is managed by Lynn Berkley of Folsom, who with her family and justice-minded friends, are increasingly embolden about scaling this event to a point where the Sacramento Region uses Sacramento Faces Race as an umbrella brand that unites our community. Last year, thousands participated with their community organizations, religious groups, and student bodies to discuss the underpinnings of what has become a constant societal discussion—systemic racism. This year, the third annual Sacramento Faces Race weekend will be October 26-29. Taking place at sites like the Sacramento Public Libraries, Folsom Lake College, coffee houses, and houses of worship, SFR continues to deliver its promise to be the country’s largest Teach-In ever to address systemic racism. The goal of the weekend is to recognize and understand systemic racism from Black-American experiences and perspectives. To learn how it operates. To see how it affects individuals and our communities. And to provide a springboard for positive and equitable change. 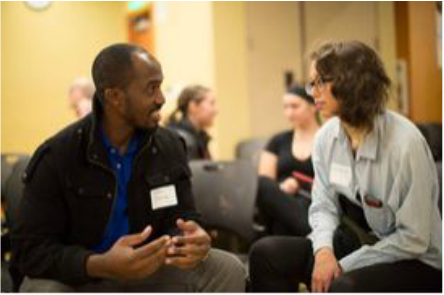 Participants are invited to professionally facilitated panel discussions, creative programming opportunities like our 2015 Hip Hop Green Dinner, or to simply download a self-directed discussion.